For some people special occasions are something they love celebrating and enjoying with loved ones. To others they can feel like a burden and a chore, something they are obligated to deal with. 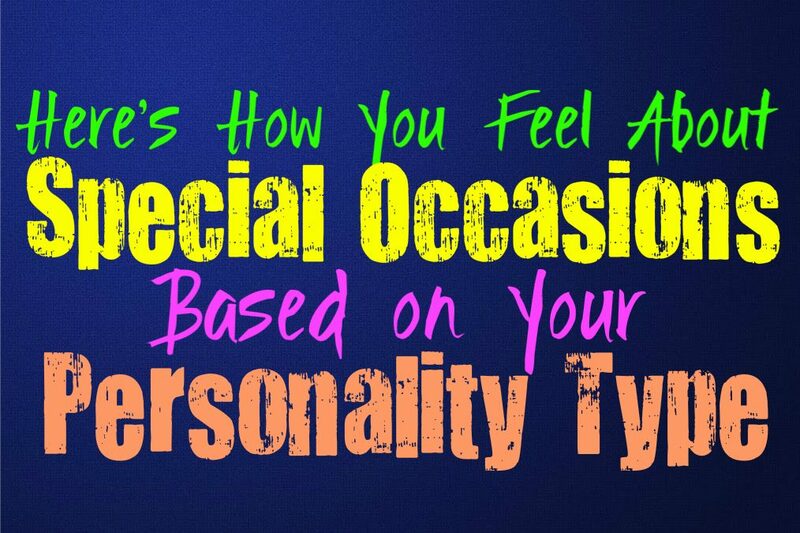 Here is how you most likely feel about special occasions, based on your personality type. INFJs might enjoy special occasions, especially the ones which celebrate the people and things they love most. INFJs can become annoyed with certain larger holidays though, simply because they can be rather overwhelming. These special occasions feel more like work than a celebration, and can place too many rules and expectations onto the shoulders of the INFJ. When it comes to certain special occasions they will often feel differently, especially if it is an anniversary for a relationship or friendship, since these are special and important days to them. ENFJs often enjoy special occasions, especially the ones that bring joy to their loved ones and themselves. Special occasions like birthdays and anniversaries are often truly important to the ENFJ, since it is an opportunity to celebrate their love for others and to feel that love in return. Since ENFJs often spend so much time and energy focusing on others, it is nice to feel this greatly reciprocated on special occasions. Having someone they love go out of their way to make these days special for the ENFJ, is truly meaningful for them. For the INFP certain special occasions can be quite a drag, especially the ones that require a lot of human interaction. Holidays with their endless parties and family members placing judgement on them, as well as the incessant chatter about shallow things that mean very little to the INFP. These events are for them, but there are some special occasions that might hold a deeper meaning. For the INFP it entirely depends on the occasion and why it is so important, since it has to hold a personal attachment for them to truly value these benchmarks. ENFPs might not always focus much on special occasions, especially if they don’t hold a personal meaning for them. It can be fun to celebrate certain events or benchmarks, but they rarely feel a need to make a huge deal out of it. For the ENFP it has to hold a real and deep meaning for them, something that they value and this might not always be what others expect. For them the holidays and special occasions can mean everything or nothing, depending on what has happened to make it personal. ENFPs can be truly unpredictable people, who don’t always fit into the mold that others set for them. INTJs rarely find themselves all that drawn to special occasions, but they with celebrate them nonetheless. This is often because someone close to them values these days, or because it seems like the appropriate thing to do. INTJs can become weighed down by too many celebrations which involve constant social interaction and mindless chatter. They might hold certain benchmarks or anniversaries close to their heart, but they rarely make a dramatic expression about this. ENTJs might not really care much for certain special occasions, but they enjoy a good party now and again. At first they might appear hesitant but ultimately they enjoy the chance to get together with friends and loved ones, and simply have a good time. For the ENTJ some special occasions can seem a bit meaningless though, and the ones that truly matter are the ones that hold a more in depth value. Things like anniversaries where they can celebrate a time shared with someone they love, those moments are often special to the ENTJ. INTPs might not care much for certain holidays, but for them it often depends on the environment they are living in. If it is something that becomes this long and drawn out experience, involving constant social interactions and pointless parties- then it can become a bit overwhelming for the INTP. They do enjoy the opportunities to celebrate certain special occasions like birthdays, especially if they have always been meaningful for the INTP. For them certain special occasions can simply feel like a lot of pressure to perform and act a certain way, and this can be exhausting for the INTP. ENTPs might become annoyed by some over-celebrated holidays, but that doesn’t mean they cannot enjoy certain special occasions. Sometimes that hold a deep personal value to the ENTP or someone they love, is something that can appreciate. Some ENTPs might struggle to get past their dislike of certain expectations that come along with special occasions, but that is often when they haven’t strengthened their weaker functions. The well-adjusted ENTP will come to appreciate certain special occasions, since it hold a special memory. ISTJs often do value special occasions, since they have strong ties to the past. They might enjoy celebrating certain occasions, especially the ones that remind them of a person they love or of an amazing experience. If the ISTJ has certain memories which hold a deep sentimental value for them, they will certainly enjoy celebrating this special day with others. They simply don’t like having to socialize with too many people for prolonged periods of time, for the ISTJ it just means they need to celebrate these special occasions with space to be on their own afterwards. ESTJs often enjoy special occasions, since they have a strong sense of tradition. They like being able to celebrate these special days, especially ones that their family is interested in. They are likely to remember special occasions like holidays, birthdays and especially anniversaries. While some people might have a hard time remembering these dates, the ESTJ often does so naturally and with ease. They enjoy celebrating anniversaries, especially if it makes their partner happy. ISFJs definitely enjoy special occasions and will often remember these days very well. They are sentimental and traditional people who value being able to celebrate special days. They are often very interested in holidays, but they also love celebrating birthdays and anniversaries. For the ISFJ these days are often very important, and they love being able to make the people in their lives feel truly special and valued. ESFJs often value and enjoy special occasions very much, since they are fairly sentimental people. They enjoy celebrating times and dates from the past, especially the ones that they feel are meaningful and important. ESFJs often plan for and anticipate these special occasions, wanting to do whatever they can to make them truly wonderful. They especially enjoy celebrating anniversaries and birthdays, wanting to make others feel truly special. ISTPs might not always care much for certain special occasions, and might even forget them from time to time. They can become so caught up in their own thoughts that they can become a bit distracted. ISTPs don’t like having too many pressures and this can cause them to feel drained by the presence of too many people. ISTPs will try to take notice of special occasions when they mean something to their loved ones, but they can still be a bit forgetful of them at times. ESTPs do care about certain special occasions, especially ones that are personal to them. Some holidays might be a bit annoying to them, especially the ones they feel forced to participate in. For the ESTP it is more about the holidays and occasions that hold a personal value to them. If they share a special anniversary with someone they love, it can actually be a day they want to celebrate and make truly memorable for themselves and their loved one. ISFPs do enjoy certain special occasions like anniversaries and often birthdays. They like being able to have something to look forward to, and to celebrate. ISFPs want to fill their lives with joy and new experiences and so oftentimes special occasions can be a great opportunity to connect with others and make them feel special. Having someone go out of their way to celebrate the ISFP and their love for them, is something they will not likely forget. ESFPs do enjoy special occasions very much, since they love any excuse to have a good time. ESFPs are surprisingly good at pulling together an event or special occasion when it is important to them. They know how to create a truly fabulous party, and want to make sure their loved ones are having a great time. ESFPs just want to make the most out of life, and so celebrating certain special occasions can be a truly great way to enjoy celebrating themselves and their loved ones.